Armchair generals extraordinaire Paradox Interactive today announced that Hearts of Iron IV players will soon have more difficult decisions to make with the launch of Death or Dishonor, a brand new country pack coming later this year. Death or Dishonor focuses on the countries of Europe caught between the dueling ambitions of the Soviet Union and Nazi Germany - faced with total destruction by a much larger force or making uncomfortable alliances, survival will take compromise, guile, and perhaps a teensy bit of luck. Death or Dishonor will be available for $9.99 on Windows, Mac, and Linux PCs - and will be delivered for free to all Expansion Pass owners. Make another not-so-difficult choice to watch the Death or Dishonor trailer. Death or Dishonor introduces new National Focus trees for Hungary, Romania, Czechoslovakia, and Yugoslavia, which revolve around navigating the ideological (and physical) land mines of central Europe during World War II. This content furthers Paradox’s goal of capturing the unique wartime experience of every nation involved in World War II, but players will also find new opportunities to change the course of history if they so choose. Revamp of Air Gameplay: Take to the skies with new mechanics and quality of life updates that make it easier to bring your airpower to bear. New Music and Art: Three new thematic musical tracks from composer Andreas Waldetoft, new art content for the four focus nations, and new troop voiceovers. New Diplomatic and Puppet Interactions: License military technology to bring other nations’ weapons to the field or sell your advances to the highest bidder. Fascist countries get new subject levels like Reichskommissariat, with access to licenses, industry and strategic resources. The instated governments are held in an iron grip, making it harder for them to break free. 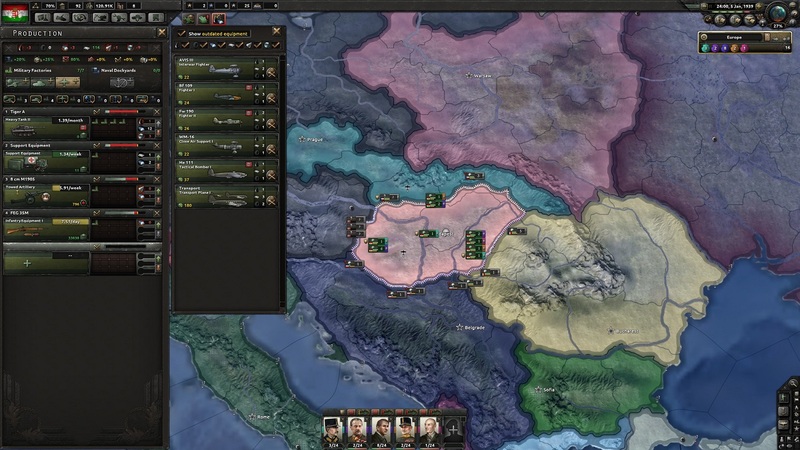 For more information about Hearts of Iron IV, visit https://www.paradoxplaza.com/hearts-of-iron-iv.